Re-formed in 1969, the club is now one of the largest growing in the county with over 300 registered players. We won the Junior A championship in 1973, Intermediate in 1979 & Senior title in 1989. 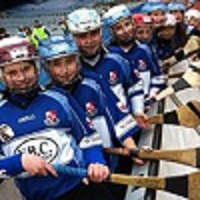 In recent years the growth explosion in Glanmire has enhanced our numbers greatly, and coupled with the fantastic facilities available to the club & an excellent underage coaching structure, Sarsfields Camogie Club is one of the most progressive in the county. Currently we field at Senior (B), Junior & Minor adult levels with our underage sector of U16s, U15s, U14s, U13s, U12s and thereon all competing at the highest level of premier. U11s, U10s, U9s & U8s all compete under the non competitive Go Games ethos of full participation, small sided games & rotation. In 2012 the club won an unprecedented 7 trophies: Munster League, two county championship titles at Minor & U14 and a full sweep of Imokilly divisional titles at U15A, U15B, U13A & U13B. 2014 was a very successful year with the club winning county titles at Intermediate, Minor and U16 levels along with Imokilly titles at U15 and U13. Contact our club phone (085) 2101800 for further information or details on various training times, etc.